Orcinus: Brian Kilmeade sez: 'Not all Muslims are terrorists, but all terrorists are Muslims.' Oh really? Brian Kilmeade sez: 'Not all Muslims are terrorists, but all terrorists are Muslims.' Oh really? Kilmeade: They can't handle the give and take of the debate. They were outraged that somebody was saying, uh, there's a reason, there was a certain group of people that attacked us on 9/11. It wasn't just one person, it was one religion. Not all Muslims are terrorists, but all terrorists are Muslims. 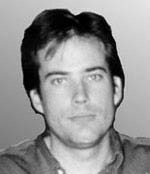 Eric Robert Rudolph (born September 19, 1966), also known as the Olympic Park Bomber, is an American radical described by the FBI as a terrorist who committed a series of bombings across the southern United States which killed two people and injured at least 150 others. Rudolph declared that his bombings were part of a guerrilla campaign against abortion and what he describes as "the homosexual agenda." He spent years as the FBI's most wanted criminal fugitive, but was eventually caught. In 2005 Rudolph pleaded guilty to numerous federal and state homicide charges and accepted five consecutive life sentences in exchange for avoiding a trial and the death penalty. Rudolph was connected with the white supremacist Christian Identity movement. Although he has denied that his crimes were religiously or racially motivated, Rudolph has also called himself a Roman Catholic in "the war to end this holocaust" (of abortion). James Charles Kopp (born August 2, 1954) is an American citizen who was convicted in 2003 for the 1998 sniper-style murder of Dr. Barnett Slepian, an Amherst, New York physician who performed abortions. Prior to his capture, Kopp was on the FBI's list of Ten Most Wanted Fugitives. 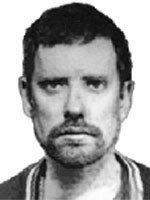 On June 7, 1999 he had become the 455th fugitive placed on the list by the FBI. He was affiliated with anti-abortion group "The Lambs of Christ." He has been referred to as a terrorist by the National Memorial Institute for the Prevention of Terrorism. Letters left at the scene of an April 1996 bank robbery/clinic bombing in Spokane, Washington, contained Identity propaganda, diatribes against the banking system and were signed with the symbol of the "Phineas Priesthood." [At the time of the robbery, a bomb was set off at a nearby Planned Parenthood clinic as a diversion, with death threats toward abortion providers contained in the note left with that bomb.] The three men arrested, Charles Barbee, Robert Berry and Jay Merrell, were linked to white supremacist and "Identity" groups and were also charged with setting off bombs at a newspaper office and a Planned Parenthood clinic. All three were convicted. 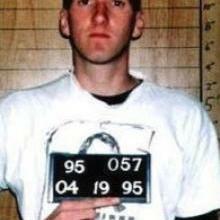 Timothy James McVeigh (April 23, 1968 – June 11, 2001) was a United States Army veteran and security guard who bombed the Alfred P. Murrah Building in Oklahoma City on the second anniversary of the Waco Siege, as revenge against what he considered to be a tyrannical federal government. The bombing killed 168 people, and was the deadliest act of terrorism within the United States prior to the September 11, 2001 attacks. 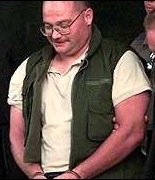 Buford O'Neal Furrow, Jr. (born November 25, 1961) perpetrated the August 1999 Los Angeles Jewish Community Center shooting on August 10, 1999, when he attacked a day care center at the North Valley Jewish Community Center. The shooting injured three children, and a receptionist. He also shot dead US Postal Service carrier Joseph Ileto who was Filipino American. Furrow was a member of the white-supremacist group Aryan Nations in 1995. On January 24, 2001 Furrow pleaded guilty all of the counts against him. In exchange for pleading guilty, Furrow avoided a possible death sentence, but was instead sentenced to life in prison without the possibility of parole. According to the indictment, Furrow expressed no regrets for any of his crimes. This is just a sampling. There were many more such cases in which clinics were bombed, government officials and offices threatened or attacked. These activities slowed considerably in the past eight years, but continue to bubble along. There was, for instance, the case of Demetrius "Van" Crocker, who was caught trying to buy explosives he planned to bomb Congress with. Or William Krar, who put together a cyanide bomb he planned to set off in a public venue. Or Chad Castagana, the self-described Coulter/Malkin worshipper who sent various liberal figures fake anthrax threats. There have been many others. -- May 2009: A "sovereign citizen" named Scott Roeder walks into a church in Topeka, Kansas, and assassinates abortion provider Dr. George Tiller. -- June 2009: James Von Brunn opens fire at the Holocaust Museum, killing a security guard. -- July 2010: An agitated right-winger and convict named Byron Williams loads up on weapons and drives to the Bay Area intent on attacking the offices of the Tides Foundation and the ACLU, but is intercepted by state patrolmen and engages them in a shootout and armed standoff in which two officers and Williams are wounded. That's sixteen major incidents in a two-year period -- significantly more than we've seen over the same timespan from domestic radical Muslims. The BPC's report enumerates a total of seven incidents in 2009 -- two attacks and five serious plots (not to mention four attempts to join terrorist organizations). We've had the same number of right-wing extremist-related incidents of domestic terrorism in 2010 so far -- and the year isn't even over yet. This has in fact been quite predictable, especially considering that both the Southern Poverty Law Center and the ADL have reported a significant increase in recruitment by right-wing extremists, particularly white-supremacist and radical "Patriot" groups, in the wake of President Obama's election. These two factions, after all, have been responsible for the overwhelming majority of domestic-terrorism cases of the past thirty years and more. Indeed, the problem is serious enough that the Pentagon has finally begun to clamp down on the far-right extremists who have been infiltrating the ranks of U.S. troops in recent years. But right-wingers are always eager to dismiss the reality of right-wing extremists -- even in the face of overwhelming data. So this means, evidently, that when we now assess terrorism on a "bipartisan" basis, we must omit them altogether. Finally, perhaps the more important point: We were not attacked by one religion. We were attacked by fringe fanatics from that religion, not the religion en masse. Some of our important allies in this fight, as it happens, are Muslim. Just remember: Every time idiots like Kilmeade say crap like this, Osama bin Laden -- who envisioned 9/11 as a way to create a war between Islam and the West -- pops a champagne cork. Oh, and Brian? Just remember: Not all right-wingers are racists. But all racists are right-wingers.